Father Mercer tells the story of the life and labors of Jesse Mercer, a leader in Georgia Baptist life during the first half of the nineteenth century. His influence was felt in many areas as he was pastor of several churches, author of numerous writings, editor of a newspaper and a hymnal, philanthropist, and denominational statesman. Mercer’s life span and his ministerial responsibilities uniquely positioned him to play a key role in the development of Baptist thought in the Old South. Before Mercer’s birth, Baptists in Georgia were not able to worship freely, were not organized for missions and had few opportunities for ministerial education. Throughout his adult life, Mercer helped Georgia Baptists utilize their newfound freedom to spread the gospel and equip pastors through the formation of the Georgia Baptist Convention and Mercer University. Readers may be particularly interested to discover the difficulties faced by Jesse Mercer as he attempted to persuade fellow Baptists to join in collaborative efforts for missionary and educational enterprises. The trajectory that began in Mercer’s day continues even now as Baptists lead the way in Protestant missionary efforts and Mercer University is one of the largest Baptist educational institutions in the world. Yet, rather than telling the story of a larger-than-life pastor with whom few “ordinary” pastors can identity, Father Mercer reveals how one who is faithful in small things can, over time, bear much fruit for the Lord. Pastors who have been wounded by church members by their neglect of Christian duties will strike a friendship with Jesse Mercer who handled more than his share of opposition. College students who have left home for the first time will discover how God used the twists and turns in Mercer’s life to prepare him for opportunities he never foresaw. Anthony Chute has provided Baptists (and others interested in 19th century religion) a very readable account of Jesse Mercer’s life – an account long overdue given Mercer’s religious influence among Baptists in the antebellum South. Chute writes about the proponent of the “doctrines of grace” most gracefully, even humorously at times. Grounding his work in fine scholarship, Chute makes Mercer a conversation partner for contemporary issues. For example, Chute’s story of Mercer’s conflict with Primitive Baptists over the doctrines of Calvinism reveals how to make scholarship accessible to all readers. The decision to include the texts of numerous writings from the pen of Mercer enhances the book. Tony Chute has provided us with a marvelously-written story regarding the life, ministry, and writings of Jesse Mercer. 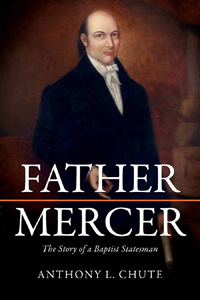 The engaging account of "Father Mercer" offers a wonderful window for better understanding one of the most influential leaders in 19th Century Baptist life. Similarly, this readable volume gives us greater appreciation for the shape, ethos, and challenges of Baptist life during this time. It is a privilege to recommend this insightful work, which grants us not only a glimpse into both the accomplishments and disappointments in Mercer's life and ministry, but simultaneously presents readers with opportunities for thoughtful reflection on a variety of significant themes, including Christian unity, the importance of leadership, and the place of theological education. This is a wonderful introduction to the life of Jesse Mercer, one of the most important leaders to prepare the way for the founding of the Southern Baptist Convention. A faithful pastor, Christian writer, and promoter of foreign missions, Mercer also helped to found the university that bears his name. Readers who want to know more about this Georgia Baptist statesman can do no better than to begin with Tony Chute's insightful work. Among antebellum Baptists in the South, few figures surpassed the influence of Jesse Mercer. He wore many hats, including pastor, theologian, editor, and educator. He was also a tireless missions advocate and a key apologist for Baptist denominationalism. In recent years, Tony Chute has written several helpful articles and a fine scholarly monograph about Mercer's life and influence. I'm delighted Chute has now given us this helpful popular introduction to the famous Baptist patriarch. The combination of narrative chapters and primary source material makes Father Mercer an ideal resource for introducing students and scholars to a variety of important topics related to 19th century Baptists in the Deep South.